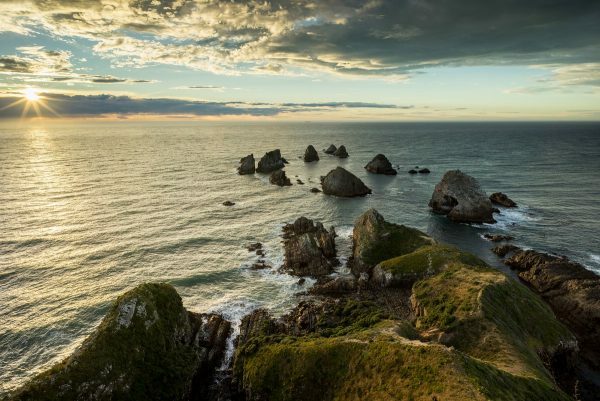 This part of my trip along the east coast of New Zealand’s South Island is typical sightseeing, of course with the special focus landscape photography. I arrived at Christchurch airport in the late afternoon. The first point on my agenda was getting my rental car. The vehicle was small but sufficient for a single person. 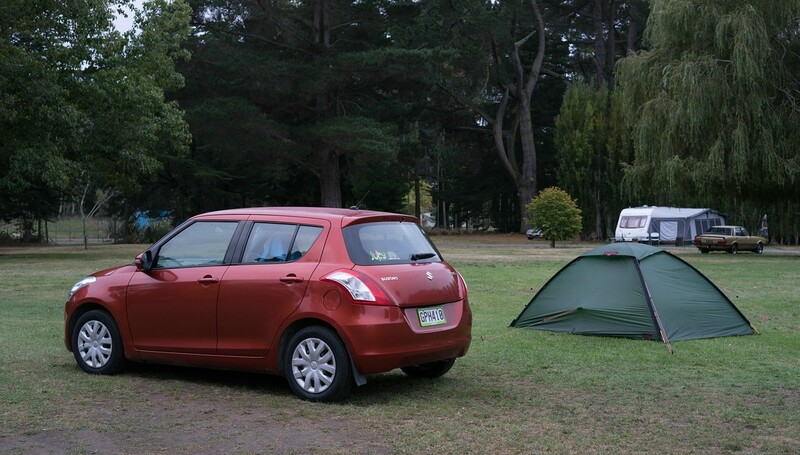 As I had a tent anyway, it wasn’t necessary to have enough space for sleeping in the car. The next day I spent a few hours exploring Christchurch. The South Island’s largest city is still in the process of reconstruction after the earthquake in 2010. The cathedral is heavily damaged and will likely be demolished. In the city center where a lot of buildings had to be torn down, a shopping centre made of colorful shipping containers has been set up – certainly worth a look. I also liked Hagley Park with the botanic gardens. I left Christchurch driving south along highway 1. The first part until Timaru was not very interesting and crossing mostly farmland. First I wasn’t sure whether to turn towards the lakes Tekapo and Pukaki or to continue on towards the south. My decision was to keep the lakes and Mount Cook for later in my itinerary. The road from Timaru south along the coast offers certainly some interesting stops, but I wanted to reach the Moeraki Boulders in the evening. 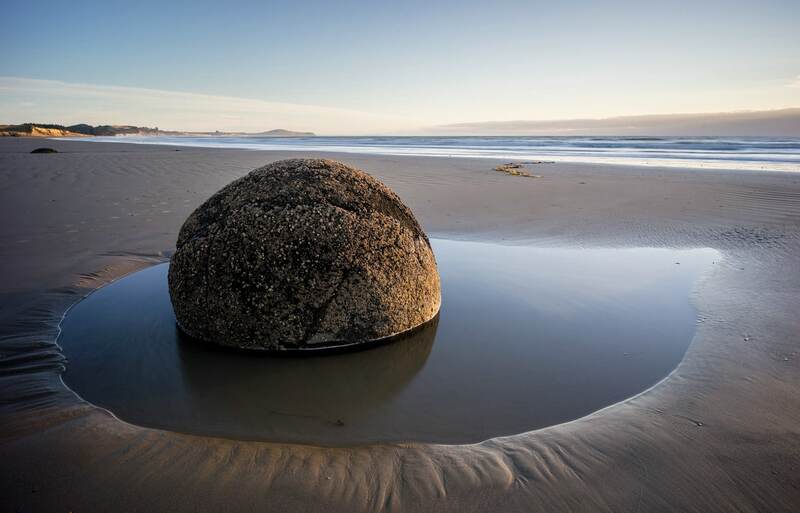 The Moeraki Boulders are a very popular attraction for photographers and “iPhone-tourists” alike. As expected, when I reached them in the evening there were a lot of people around the egg-shaped rocks. Considering the hype, I was a bit disappointed. The rocks were rather few and did not seem very impressive. In addition, the tide and the light conditions were not in my favor. 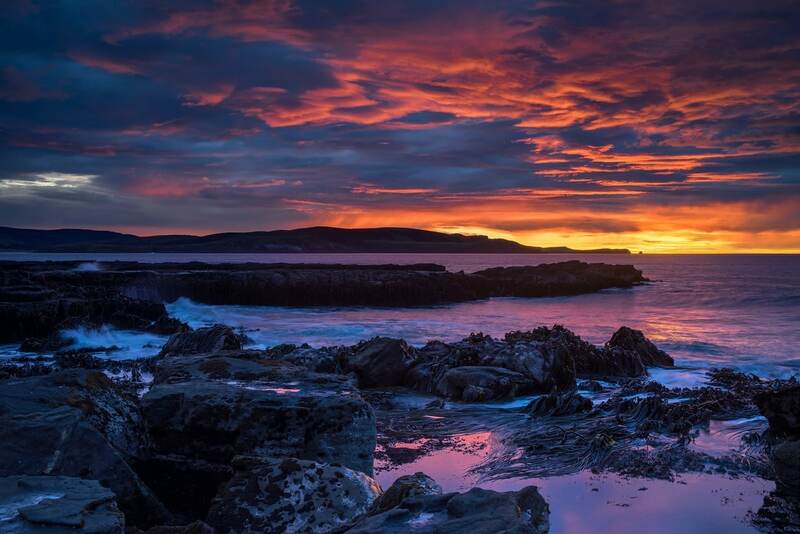 Thus, I decided to come back in the morning when the sun would rise above the sea and pitched my tent at a beautiful small campsite near Hampden. The beach at the campsite was also worth a look. 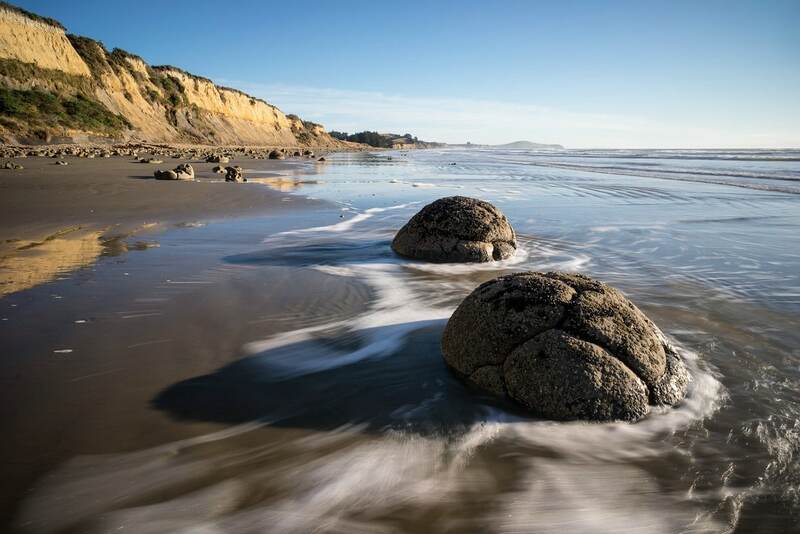 The campground is located within walking distance of the Moeraki Boulders – it’s only a few kilometers along the beach. This would make a great morning walk. I left my tent in the darkness and walked with my headlamp along the beach into the dawn. Unfortunately no clouds in the sky – bad weather for landscape photography. As expected, when I reached the Boulders there was already a group of photographers setting up their tripods. Thus, some rocks were already “occupied”. I picked one from the rest that seemed interesting and set up my gear waiting for sunrise. 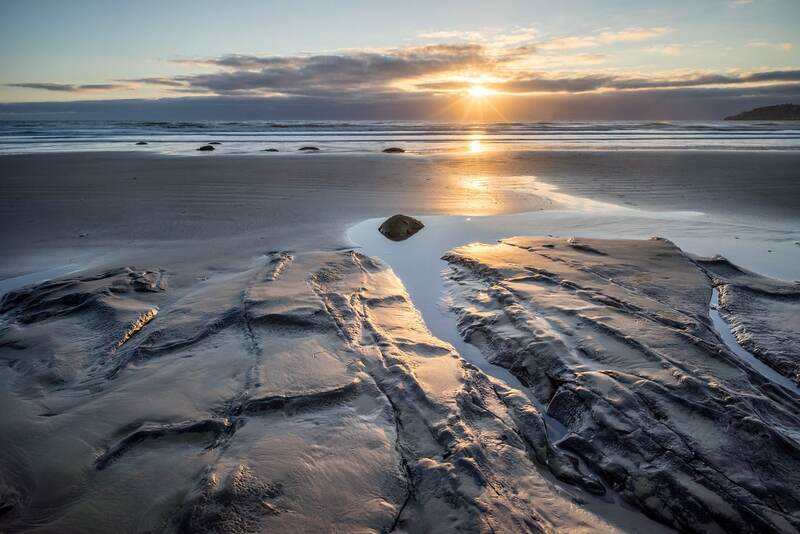 The sand-covered rock formation provides an interesting foreground for a shot towards the sun. Furthermore, on the way back to my campsite along the beach I found other interesting spots including smaller “twins” of the Moeraki Boulders. Those I had all for myself – unfortunately now in harsher light. My advice: Don’t focus too much on the Moeraki Boulders themselves. Have a look around and maybe you find better locations that are less crowded. If possible, take the tide into account; I think the boulders are most interesting when they are hit by the waves. And: The beachwalk alone is really enjoyable (see also the photo at the start of this article). 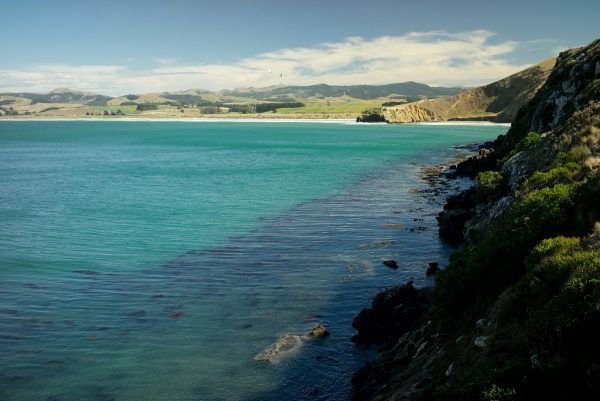 On the way south from Moeraki, Shag Point is worth a stop. Here you can see a lot of lazy seals on the rocks. If you bring a telephoto lens – which I didn’t – you can probably get some interesting shots. But be sure not to disturb the animals. My next stop on the way south was the Dunedin. 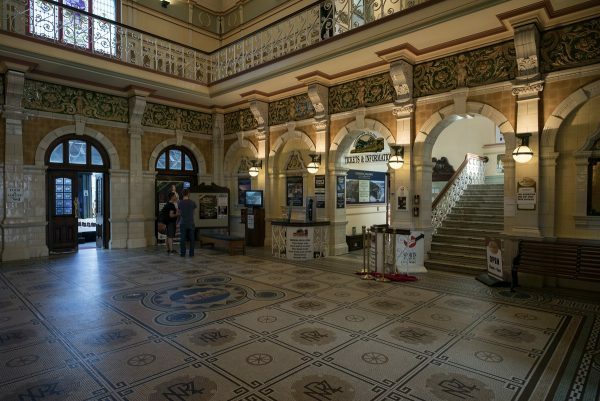 The city – founded by Scottish settlers – has a beautiful center with European flair. I didn’t find the like elsewhere on New Zealand’s South Island. Be sure to have a look at the old train station from inside – you will be impressed. 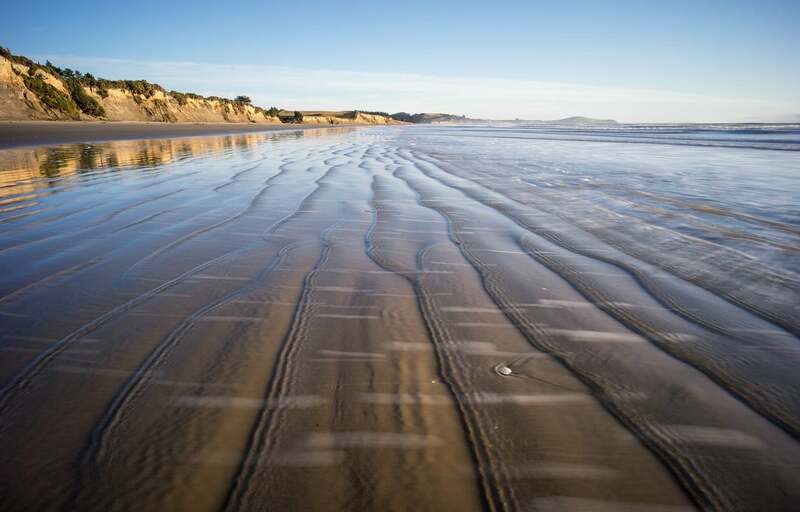 Heading south-west from Dunedin I reached the Catlins Coast, a sparsely populated hilly region in the very south of the South Island. My first longer stop on the Catlins Coast was the well-known Nugget Point, again a tourist and photography hotspot. The campground in Kaka Point is ideally located only a few kilometers away. 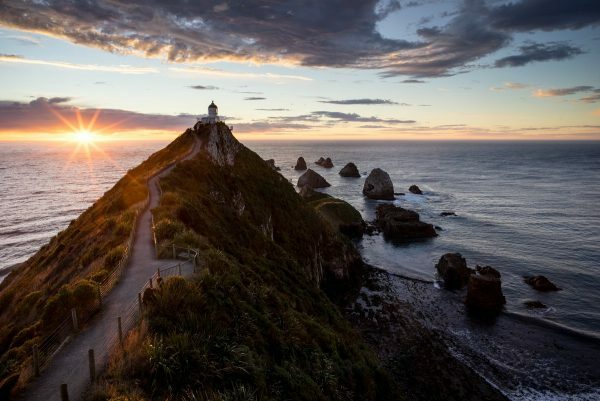 Besides the famous lighthouse view with the “nuggets”, Nugget Point also offers seal watching opportunities. My evening visit was used for scouting the location and some seal-watching. In the early morning I would return in the hope for a nice sunrise. As usual, getting up early was no pleasure. When I arrived at Nugget Point it was still dark and there was already a photographer who had setup his tripod. We had an interesting chat and made sure that both of us had an unobstructed view. There is actually not much space to get a good lighthouse shot. That’s why most images you see are similar – mine is no exception. The epic red sky I had hoped for did not happen due to insufficient cloud cover. Thus, I waited for the sun to clear the horizon. Taking the conditions in account, I’m quite happy with the result. I know there is much better out there, but for me also the experience counts – and the photo refreshes my memory of that morning at the sea. Interestingly, most visitors headed directly towards the lighthouse and thus the path remained mostly clear. From the lighthouse you get a better overview of the rock formations – but the lighthouse itself will be out of your frame. 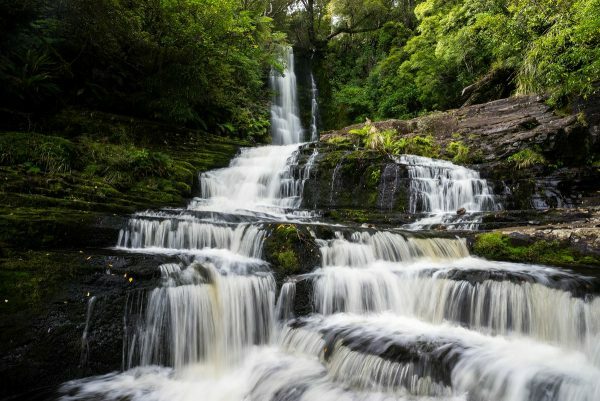 The Catlins feature several waterfalls. Arguably the most interesting are Purakaunui Falls and McLean Falls. Both waterfalls are nicely located in dense native rain forests clearly contributing to their beauty. Unfortunately – as in many parts of the country – only a small fraction of the old-growth forests remains. Most has been cleared for farming or timber. Purakaunui Falls are the smaller of the two waterfalls. 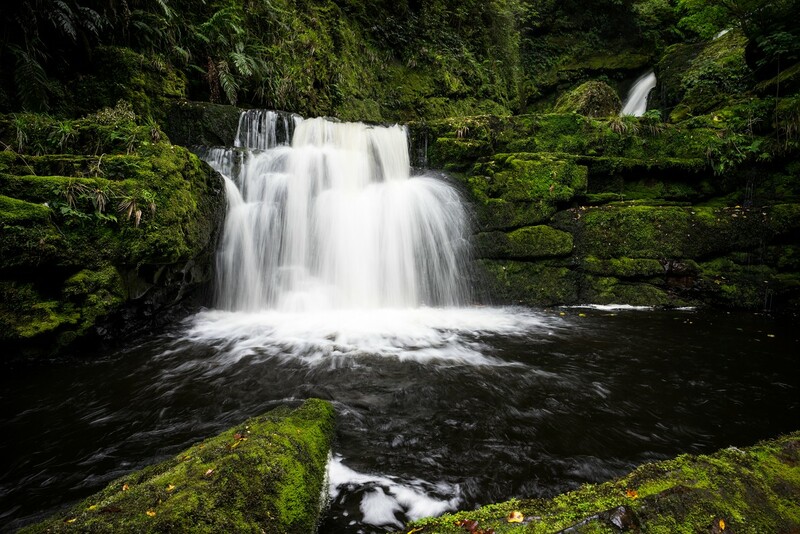 The falls can be reached via a short 10-minute forest walk from the car park. You will certainly not be alone there. The waterfall features three tiers and can be observed from a viewing platform. For the above image I went down into the river bed to get a better perspective. I used a polarizer to reduce the reflections in the wet vegetations and increase saturation. The amount of water during my visit was quite low if you compare it to the look of the waterfall in full flow. 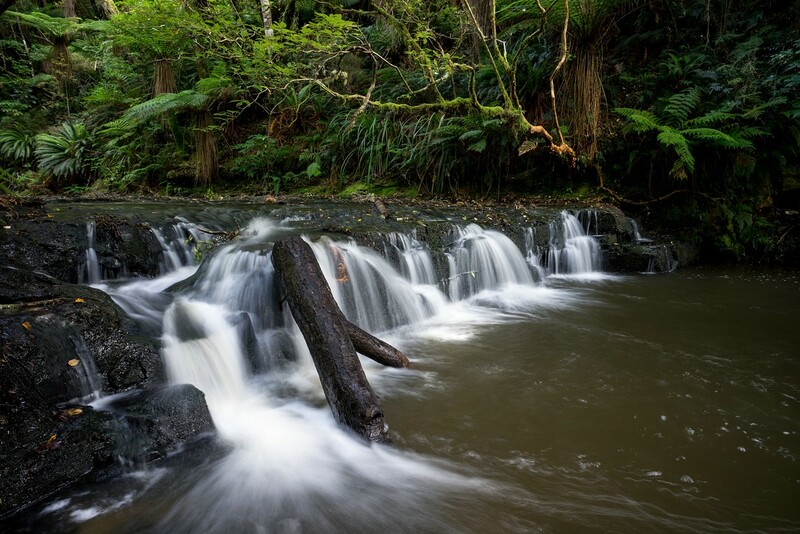 Don’t forget to have a look around for other subjects such as the small cascade depicted below. I like this scene due to the contrast of the white water and the dark forest in the background. McLean Falls are a much larger waterfall. The walk to reach the falls is about 40 minutes. You will meet a lot of visitors here as well which may prove a challenge for “tourist-free” images. 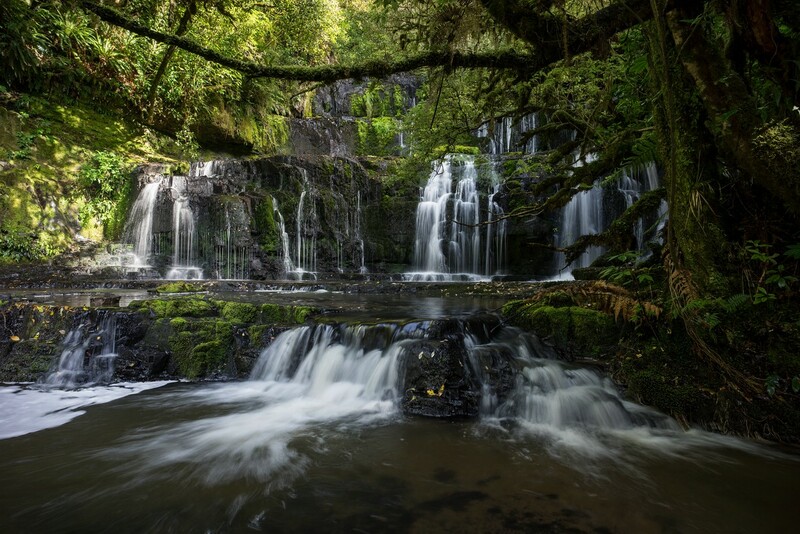 The Tautuku River descends over a number of drop-offs and terraces with several cascades. The main cascade is about 22 meters tall and drops into a pool of water that can only be seen when climbing up over the slick rocks. 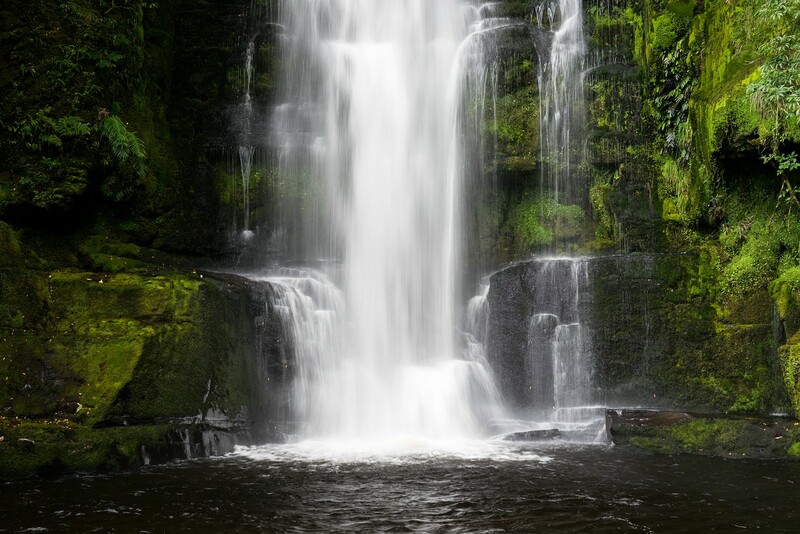 The different cascades provide a lot of photographic opportunities and perspectives. I spent 2-3 hours there. Often I had to wait for other visitors to move out of the frame. Before getting to the “real” waterfall there is a small cascade that’s worth a closer look. Also, the forest walk is really beautiful. If you’ve been to Fiordland before, it will be less impressive, of course. After these you are still looking for another touristy locations to visit on the Catlins Coast? Then don’t forget the Cathedral Caves. 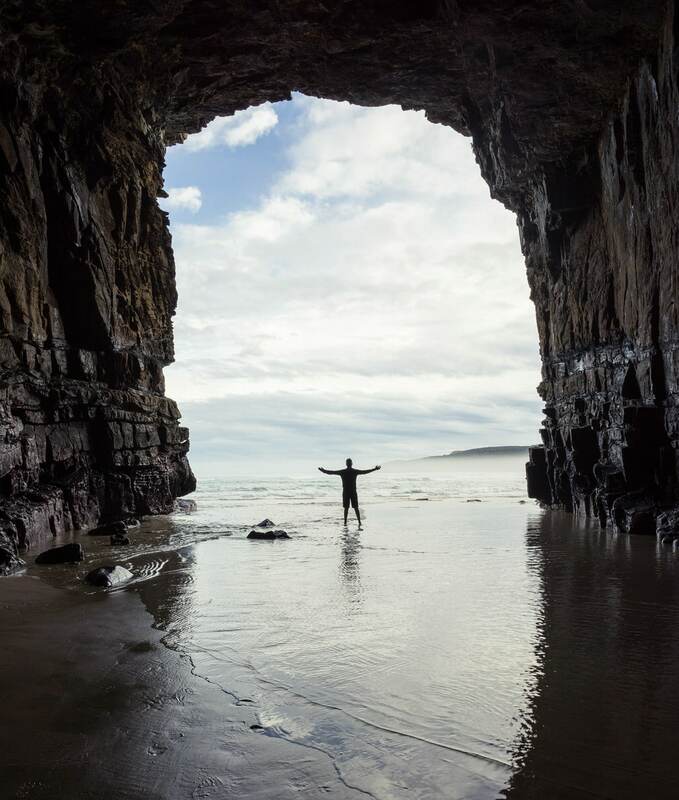 You will pass the turn-off to the caves on your way south-west towards Curio Bay. The Cathedral Caves are only accessible during low tide (the road will be closed otherwise). You pay an admission fee and then descend down the path through forest to the beach where the entrances of the caves are located. The caves seem also to be a breeding ground for sandflies. It was impossible to stand still without getting at least a few bites. In addition, you should be aware that it is often necessary to cross knee-deep water, so be prepared. 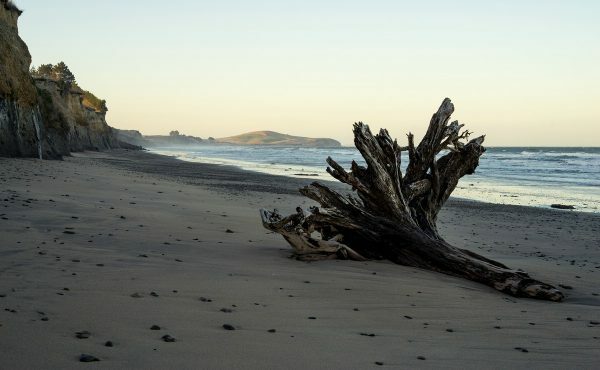 Curio Bay, located near the southernmost point of the South Island (Slope Point), is known for its petrified trees. It’s worth having a walk along the cliffs there. Maybe you will also encounter some penguins or dolphins. I was not that lucky but decided to stay at the local campsite. The weather is hard to predict and sometimes it’s easy to give up too early – especially if getting up early is involved. 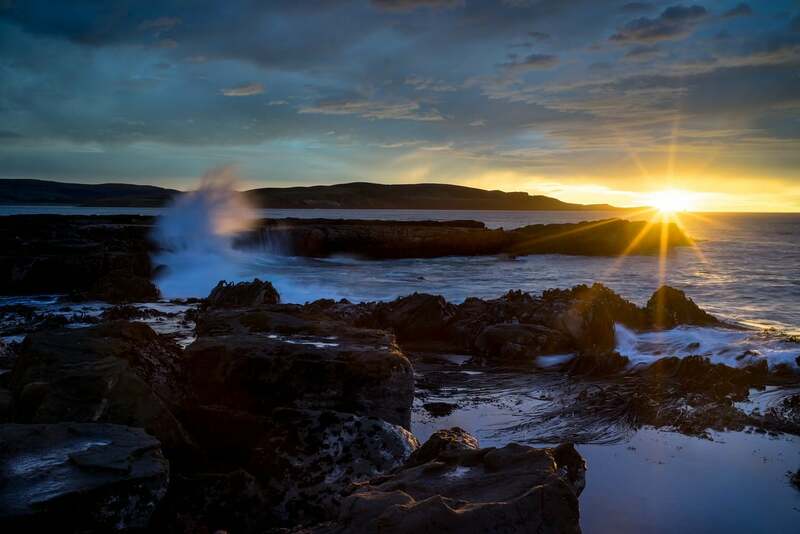 After the sun had risen I got another shot with a larger wave hitting the shore. Curio Bay concludes the east coast part of my journey. 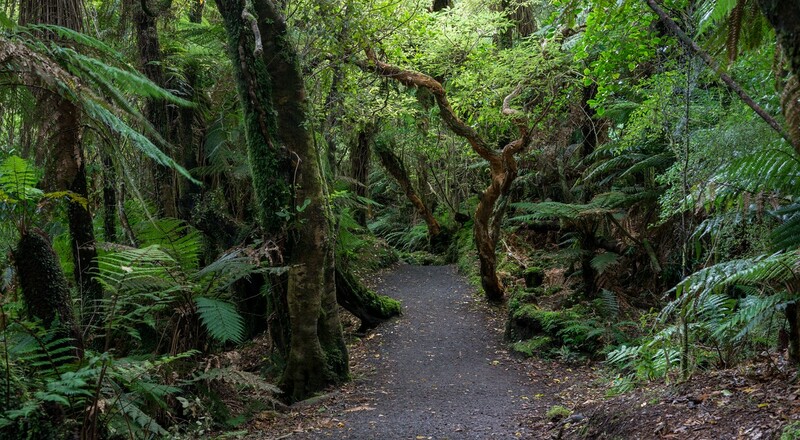 Up next is a visit to Fiordland where several longer hikes were planned. Fiordland has become my favourite region on New Zealand’s South Island. I especially liked the contrast between the lush rainforest and the alpine mountain ranges.